Which Instagram bio resonated with the test audience? Take a guess, then check out the poll results here. By a margin of 62-38, the PickFu’s panel preferred Option A, the bio with the hashtag over Option B with the slogan. Respondents who preferred Option A labeled the Option B slogan “smarmy,” cringe-worthy,” “odd,” “awkward,” and “insulting.” They responded more favorably to having a hashtag, saying it looked more modern and was easier to read. However, among respondents who chose Option B’s slogan, dislike of the hashtag was widespread. More than half (20 out of 38) of the respondents who voted against the hashtag option specifically called out their dislike of hashtags in their responses. PickFu polls are often helpful in learning what elements of an idea might be polarizing. Polarizing choices include intentional misspellings, hard-to-pronounce words or hard-to-read phrases (much like a hashtag), puns, off-color jokes, or certain imagery. In these cases, you’ll need to make a judgment call. Is it worth alienating some people in your audience? Are those who like the polarizing option more valuable to you as customers? While hashtags elicited a strong response from some, others found little distinction between the two options. In this poll, for instance, fully 16 percent of respondents said that the two options were effectively identical as far as they were concerned, and most of that group were not particularly impressed by either option. Learn how to interpret tied results, and see what other pollsters did in this situation. Do you have an Instagram bio page or social media presence that you’d like to get feedback on? 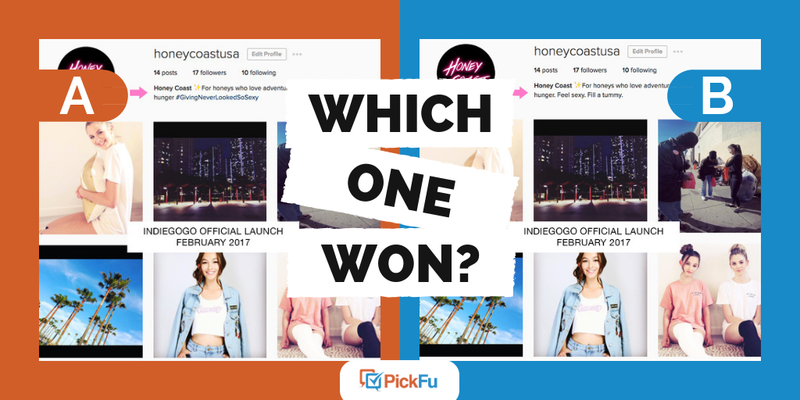 PickFu can help you A/B test your profile photo, bio, ads, or post ideas. Get 50 survey responses for $50 now. Filed under: Business, Which One Won?